It may surprise you to know that the origin of the domesticated cat, one of the mysteries of veterinary science, has only very recently been solved by researchers who carried out a genetic analysis of feline mummies found in Egyptian tombs. They extracted DNA from the remains of animals ritually slaughtered as offerings to the gods more than 2,200 years ago. The aim was to find out what genes they had in common with modern cats and wild cats, to work out how long ago humans turned them into pets. 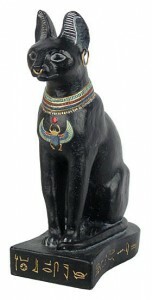 The results suggested that modern cats owed their origins to the ancient Egyptians. It appears that modern cats can trace their genealogy to the time of the pharaohs … the Egyptians may well have been the first cat breeders, an important step in the domestication process of cats. Ancient Egyptian culture is well known for its reverence of cats. The animals featured in early Egyptian art from as early as 4,000BC. The animals were still revered in the later Egyptian period, featuring in tomb art and statues, and were believed to be a manifestation of Bastet, the goddess of beauty. However, being revered was not always such a good thing for cats — because killing and mummifying the creatures was also believed to be a way of appeasing the gods. Thousands of mummified felines have been found in Egyptian tombs and catacombs, usually with ritually broken necks. The first reference to the domestic cat appears in the eleventh dynasty. Because it was hostile to snakes, it became a sacred animal of the Sun God. In the New Kingdom, the male cat was regarded as an incarnation of the Sun God and the female cat was equated with the solar eye. Feline figures may display a scarab, the symbol of the rising sun, engraved on the head or breast thus showing their solar significance. The researchers extracted mitochondrial DNA from three cats that had been mummified between 2,700 and 2,200 years ago. The results were compared with DNA taken from modern wild cats and domestic cats. The results suggested modern cats owed their ancestry to the cats of ancient Egypt — because they were bred in their millions by catteries for sale as sacrifices. It is estimated that millions of cat mummies were offered and buried in areas throughout Egypt. To supply the demand for votive offerings, catteries were established to raise large numbers of felines for slaughter. Other archeologists have reported finding what seems to have been a wild cat buried with a human in a neolithic village in Cyprus, dating to about 9,500 years ago. One idea is that cats were encouraged to settle in such villages to control mice.